Backyard Pools add value to a home. We have a large selection of inground pools to choose from. With a variety of shapes and sizes, BW Pools will assist you with picking out the perfect already designed pool, or taking the time to create a custom solution to fit your needs. The backyard Vinyl Pool is a tradition throughout the history of suburban America. Its where peoples dreams about having a pool begin. 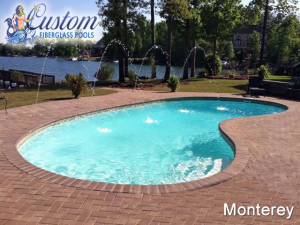 We are proud to offer Custom Fiberglass Pools Products. Stunning, unique fiberglass pools are now available! You would be surprised how small a yard an inground pool needs. Less space than you think is needed. We have multiple options to fit small spaces. BW Pools is Hampton Roads and North Eastern North Carolina premier backyard Inground Pool provider. It was like Brett read my mind! My family is so happy now that we have the nicest backyard in the neighborhood. Great pool, great company to work with. Just want to say thank you to BW Pools for quickly and cleanly installing a pool in my backyard. Brett and his team came out to my house and put in some sweet LED lights. The grandkids love it! Great Service! I thought I could only fit a hot tub in my backyard. Brett made it work, it looks beautiful next to my banana trees and fire pit. BW Pools is the best at installing inground pools! Thanks!